Activa Rigid Wrap Plaster Cloth is a versatile, high-quality plaster gauze product made to the specifications of artists and craftspeople. It is for use in sculpture, mask making, jewelry, craft projects, and more. Its even texture allows for fine detail and smooth work. Just wet it, shape it, and dry it. It may be microwaved, oven, or air dried. When face casting, the use of a release agent such as petroleum jelly is recommended. 4" Wide Rigid Wrap Plaster Cloth — This single-project sized package contains one roll, 4" wide × 5 yards long (10 cm × 4.6 m). 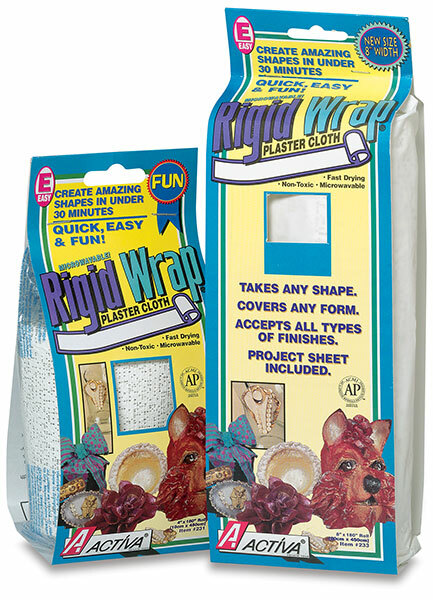 8" Wide Rigid Wrap Plaster Cloth — This single-project sized package contains one roll, 8" wide × 5 yards long (20 cm × 4.6 m). Rigid Wrap Plaster Cloth Bulk Pack — This bulk pack contains 16 yards (14.6 m) of 12" (31 cm) wide Rigid Wrap in a 5 lb (2.3 kg) bulk pack.